From Canon, an EOS Rebel SL1, the “world’s smallest and lightest DSLR” camera*, perfect for capturing amazing photos and HD videos of your kids being active. It’s small size means it’s easier to have with you at the playground, field, arena, or gym. Kari will also be joining us for the chat. She’s been featured in the Globe & Mail, Toronto Star, and Backpacker Magazine for her work getting families outdoors. We’ll be announcing winners throughout the chat. Sherrie Mae Guthrie will be asking the questions while Diana M. will be announcing the winners. To be eligible for prizes you need to have a Canadian address and you need to pre-register using the form below. *As of November 1st 2013 Canon’s research. 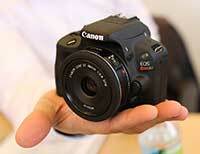 Among digital SLR cameras with APS-C size equivalent sensors.